Greetings from England! I hope you've been enjoying the festivites, had a great Christmas Day and are looking forward to the new year. I have some holiday now, so plenty of radio time and in the next few days I'll be looking through the logs for 2017 and counting up the number of different stations heard, just like I've done for the last couple of years. Despite the authorities in the Netherlands taking a greater interest in MW activity over the past 12 months, I have a feeling that the number of pirates active is pretty high, perhaps greater than the previous year. I might not have written here on the blog for a few weeks, but I've been listening and keeping up to date with what's been going on . . . It's been a long time since I heard the Viking en Tante Foek on the air. Together with Technical Man and Utopia, we paid them a visit in the summer of 2016, so it was good to catch them broadcasting for the first time since that meeting. 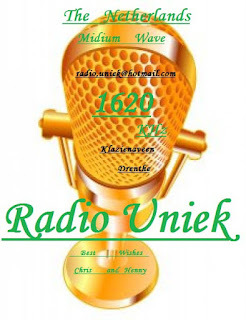 When you hear live singing on 1671 kHz, it can only be one station! A new name cropped up on the band tonight. Pereboom appeared on 1647 with a report for Oldtimer. It seems he was broadcasting from Friesland, but I have no other details other than this seems to be a pirate from the past returning to the air.